CCEGL supports educators to continue to learn and think outside the walls of the schoolhouse and to expand the boundaries of education …by bringing new passion into their work. In what ways can the CCEGL Institute be transformative for the participants and how can it have an impact on changing the way we do education? The Institute provides time and space for looking deeply into the environmental challenges that are affecting all of us on this planet. Classes incorporate poignant, up to date readings and short documentary films that are used as a catalyst for dialogue and educational exploration. The institute provides space for critical reflection about important issues that is seldom available within our school settings due to the focus on test preparation and “raising scores.” As teachers complete the institute and participate in the international activities, they have the opportunity to reassess their own role as educator. Participants reflect on why they they entered the profession and how they can better connect and infuse important environmental, global, cultural and social justice themes into their teaching. For many, the journey is life-changing. 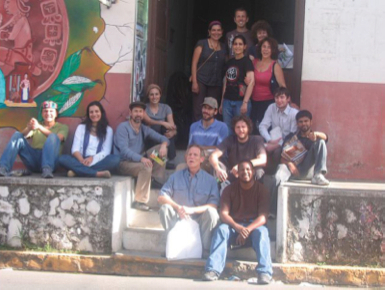 Why does the CCEGL Institute focus on the themes of Water, Food Sustainability, Climate Change and Indigenous Cultural and Linguistic Survival while preparing to work in El Salvador? These themes are interconnected and one affects the other. When we look at water, teachers can guide students to begin to find out about their own community watershed. 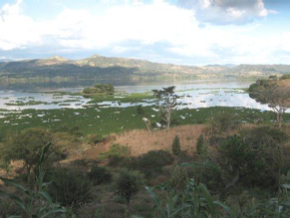 Throughout the world, and in El Salvador, there is a growing problem of water scarcity and pollution, plus the drive towards privatization of water. Related to food, many of the low income communities in which our teachers work are referred to as “food insecure.” Yet, on a positive note, farmer’s markets and school gardens are beginning to flourish as a positive movement towards local sustainability. Both in this country, worldwide and in El Salvador small farming has diminished, as industrial agriculture takes over, forcing farmers to migrate to the cities or immigrate to find work. Climate change is huge everywhere…The recent international climate conferences have given us opportunities in our CCEGL Institute for ongoing conversations. For young people, there are so many entry points to begin to understand and grapple with the challenges we face as a human community and also how much we can learn from traditional cultures. 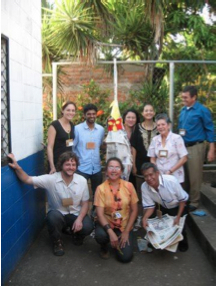 How did CCEGL begin working with teachers in El Salvador? organizations were formed. One frequent visitor to the Bay Area, Maria Serrano, was an important leader in the liberation movement. A Bay Area film maker documented her life in order to expose the US government involvement in the ongoing war. After the war, Maria was elected as a delegate to the National Assembly but after three years she decided to leave and pursue a teaching credential at the National University. It was immediately following her graduation that she came to the Bay Area for a showing of the film. When she returned to her community to teach, she invited our team to come to El Salvador to work with teachers; to share teaching strategies that would encourage students to become more involved in their education and to inspire critical thinking. How does CCEGL approach working in an indigenous community? Our organization has come to know the community of Izalco, which was at the center of the indigenous rebellion and subsequent massacres of 1932. We have developed a relationship with the “Ama Foundation,” family of the indigenous leader, Jose Feliciano Ama, killed by the government for organizing peasants to reclaim their ancestral lands. Members of the Ama family have visited the Bay Area on speaking tours. Our organization was asked to work with the indigenous community in Izalco to explore ways to integrate indigenous themes and philosophy or “cosmo-vision” into education. We developed an interactive workshop that embraces an indigenous cosmo-vision and connects this vision to literacy development through environmental-agricultural, artistic and linguistic teaching and learning. 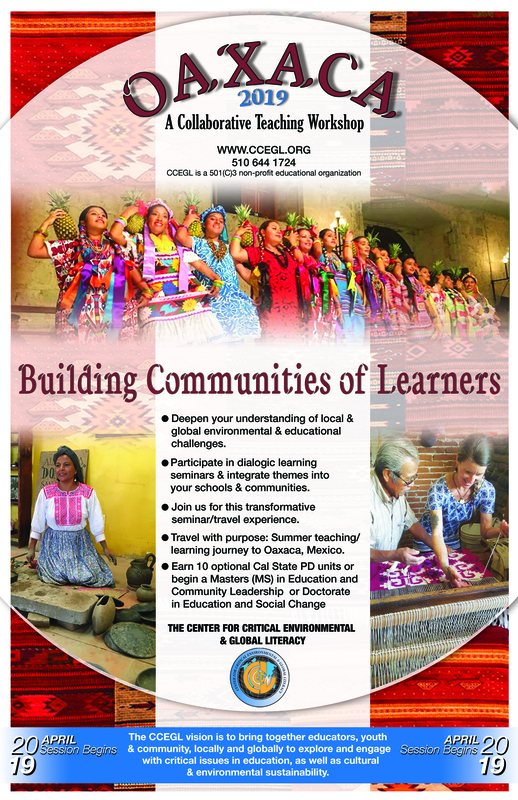 We have learned much from the educators and leaders of the Nahuatl community. Because of this experience, participants are able to broaden, not only their own understanding, but their student’s understanding of Native cultures in this country, on this continent and to understand that the struggles of indigenous peoples are similar all over the planet. They discover that we have much to learn from how Native peoples have been the keepers of the earth for thousands of years. How do the teachers connect the international work to their classrooms and communities here? Teachers are supported by the CCEGL Institute to bring the environmental themes into their classrooms and to both look critically at available resources and create their own materials…The students in the classrooms take an active part in preparing for their teacher’s journey. Many classrooms in the Bay Area have immigrant children from El Salvador and other parts of Central America, as well as Mexico and the children are eager to learn more about a Spanish-speaking country. They not only see films and read books about the region but they also write and illustrate books for children in the host schools. They learn about people in another part of the world: a part of the world that many of their families are from. What goes into the preparation for an International teaching workshop? The Institute begins with a study of the principle environmental themes of Water, Food Sustainability, Climate Change and the Cultural and Linguistic Survival of Indigenous Peoples. We do this through film, videos, readings and discussions with social and environmental activists. Participants learn about the injustices of both the national and global political and economic systems as well as the hope that springs from grass-roots organizations and movements that are challenging the current order. We explore ways of bringing these themes into our classrooms. Who are the participants in this Institute? They are teachers, community cultural workers, social workers, artists and others who are committed to understanding on a deep level, the environmental justice issues facing their communities and communities around the world. They are educators who wish to develop relationships of solidarity with educators in other countries. We always take a local and a global approach in our work. In general, our participant teams are very multicultural. This aspect of our team is always of great interest and even fascination to our host community. They are not used to such a level of multicultural diversity as we bring…and so much great conversation goes on because of this reality. Also because we are working in a Spanish speaking country, we try to include as many Spanish speakers on our team as possible.